This is a simple Social media gadget for your blog. 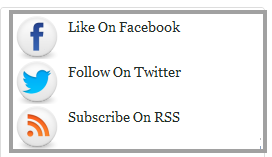 you can link Facebook fan page, Twitter and Rss subscribe. Its easier to add to your blog.you can try it. 1. Log in to blogger and Go to Design >> Page Element. Thanks for sharing and its easy, I have done the same, without using the inbuild "share it" widget.